This injury is usually the result of excessive valgus stress on the elbow during repeated throwing (especially during the cocking phase of a throw). 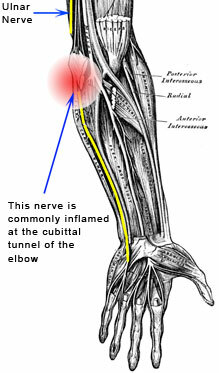 Sometimes a direct injury to the nerve within the cubital tunnel (“hitting your funny bone”) will result in nerve damage. Symptoms include tingling and numbness in the ring and pinky fingers. This may occur during or after throwing or with prolonged bending of the elbow. Changing throwing technique, bracing if necessary, and therapeutic exercise may be helpful. If the problem persists, or there is prolonged weakness, then surgery is indicated.